Members of the VAR Stars were selected based on factors such growth, industry leadership and recognition, and innovation. Selection is not based on revenue and those firms chosen to represent a wide range of size and many different software publishers of accounting software. July 2018 – Accordant Company has been named to the Bob Scott’s Insights Top 100 VARs for 2018. The Top 100 resellers are chosen from organizations specializing in the sale and implementation of Enterprise Resource Planning (ERP) and accounting software. January 2018 – Accordant Company, has been selected as a member of the Bob Scott’s VAR Stars for 2017, a group of 100 organizations honored for their accomplishments in the field of mid-market financial software. August 2017 – Sage, the market leader for integrated accounting, construction management, payroll and payment systems, today announced the release of Sage Mobile Projects and Sage 300 Construction and Real Estate version 17.1. Sage Mobile Projects allows field managers and supervisors to capture and access critical project data anywhere, anytime, on any mobile device. Sage 300 Construction and Real Estate version 17.1 is the first delivery of the re-architecting of this market leading product which serves as the foundation that enables access to all project information through Mobile Projects. This release also includes the ability to design and create SQL reports. Future updates in the re-architecting of Sage’s flagship 300 Construction and Real Estate product will also deliver multiple mobile services, a new web-based user interface and a SQL database backend. 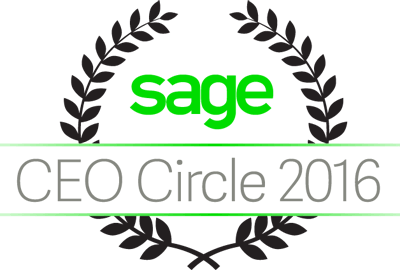 November, 2016 – Sage, the market leader in cloud accounting software, announced the winners of its Sage CEO Circle, an inaugural world-wide awards program designed to reward and recognize outstanding performance of the top business partners from around the world who serve customers, recommend products, and advocate for Sage. Sage business partner Accordant Company, LLC was announced as a Sage CEO Circle 2016 winner in the Sage North America Top Three Business Partners. September, 2016 – Accordant Company, a leading provider of construction & real estate solutions, today announced it has established a value added partnership with InfinityHR, a leading provider of cloud-based human capital management solutions. The partnership will give Accordant Company the ability to offer a robust and easy-to-use Human Capital Management solution for their client base, including integration with Sage 300 CRE and Sage 100 Contractor platforms. June, 2016 – Accordant Company has been named to the Bob Scott’s Insights Top 100 VARs for 2016. The Top 100 resellers are chosen from organizations specializing in the sale and implementation of Enterprise Resource Planning (ERP) and accounting software. February, 2016 – Accordant Company, a leading provider of construction & real estate solutions, today announced it has acquired the Sage practice of Full Circle Solutions Group, a firm delivering solutions to construction & real estate companies throughout Pennsylvania. January, 2016 – Accordant Company is proud to announce that we’ve been named to the Sage North America President’s Circle for the 2014-2015 business year. The President’s Circle award recognizes Accordant Company as a top provider of sales, installation, and support of Sage 300 Construction, Sage 100 Contractor, Sage Estimating & Sage Construction Project Center. June 25, 2015 – Accordant Company, LLC has been named to the Bob Scott’s Insights Top 100 VARs for 2015. The list represents 100 top performers in the “Value-Added Reseller (VAR) Channel” among organizations specializing in the sale and implementation of business and accounting software. September 25, 2014 – Accordant Company, a Sage North America business partner specializing in the sales, installation, and support of Sage 300 Construction and Real Estate, Sage 100 Contractor and Sage Estimating, has been named a Sage North America Top Three Business Partner for Revenue for achieving one of the highest total product revenue across all of Sage North America for the 2013-2014 business year. June 25, 2014 – Accordant Company, has been selected as a member of the Bob Scott’s VAR Stars for 2014, a group of 100 organizations honored for their accomplishments in the field of mid-market business and financial software.